The System is a new build, for the full details you can checkout the article here, but for this issue, all you really need to know is that it’s using an Asus X99 DELUXE motherboard, where this specific issue takes place. The first thing to do is make sure that you have the latest drivers installed. 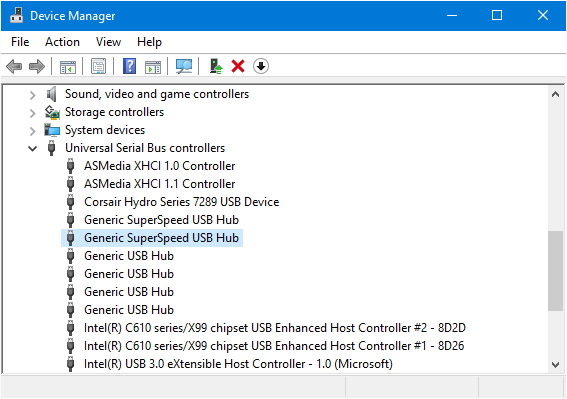 If you’re not sure if you have the latest drivers installed, I definitely recommend going to the manufacturers website and downloading updated drivers. If you know you are running the latest, do a double check, and then move on. Also, you have to try uninstalling the device via device manager. That involves right clicking on the errored device, then selecting uninstall. 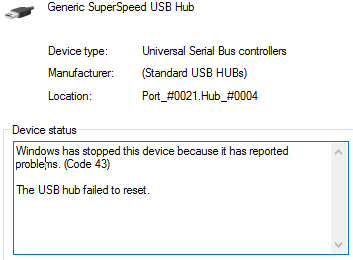 Then right clicking on the Universal Serial Bus Controllers group and selecting scan for hardware changes. If the device comes back with no errors, and stays that way, congrats, you’re done. If it doesn’t, Asus suggested doing a CMOS reset. The CMOS reset requires opening up the case, and pressing the CMOS Clear button on the X99 DELUXE. That being said, every motherboard is different, some require removing the power plug, and CMOS battery, and adjusting a CMOS clear jumper. Others just have the button… You should reference the manual for your motherboard for the correct CMOS reset procedure. For me, after doing the CMOS reset, everything started working correctly. The error went away, and everything is working correctly again. I’m not sure what caused the issue, and neither was Asus. If none of that works for you, I would suggest calling Asus support at 1-812-282-2787 and speaking with Component Support about your options. If your board is under warranty, I would suggest doing an RMA and getting your board fixed. If none of that works, call your motherboard manufacturer and see about getting an RMA to return or replace your motherboard.